We eat at least three meals a day. Thus, learning a language would be more interesting and “tastier” if we learn words relating to food. 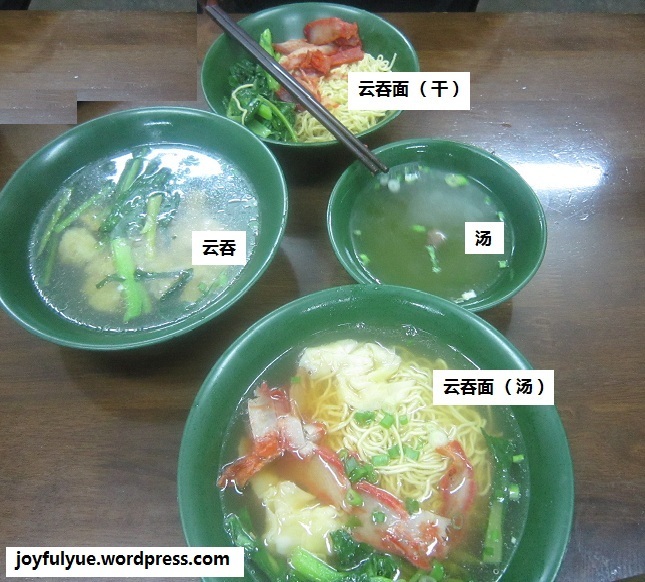 For this post, we are discussing about 云吞面, which has different versions of English name: Wanton noodles, Wonton noodles, Wantan noodles, Wanton mee, Wonton mee, etc. It is just the different pronunciation due to different Chinese dialects, but you will not go wrong by the word “云吞面”. 云吞 is dumpling, which can be cooked by boiling or frying. 云吞面 is the noodle with dumpling. 果汁 — fruit juice. The format is easy; you put the name of the fruit and end with 汁 (juice). For example, if you want orange juice, it is 橙汁; if you want apple juice, it is 苹果汁. The vocabulary can be used when you are having a meal. Enjoy the language and the food! By Wendy in Languages on 09/11/2013 .